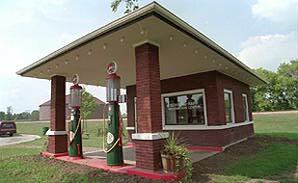 In 1925, the Behrens brothers built a gas station at 14th and Waterloo Road. This station was the second gas station built in Cedar Falls. John Rapp, a former employee at the station, purchased the business in 1966, and operated it until 1990. When the building was threatened by new highway construction in 1993, a group of Cedar Falls citizens, assisted by the city of Cedar Falls, found a new site for the station and arranged for its move. In July of 1993, the station was moved to its present location and opened as a tourist information center.